The White Kitchen – Yay or Nay? Regardless of the size of your living room or the comfort of the TV room, guests always seem to migrate towards the kitchen. This means that your kitchen should be one of the hot spots in your house, as it is a public space which also has to be practical. 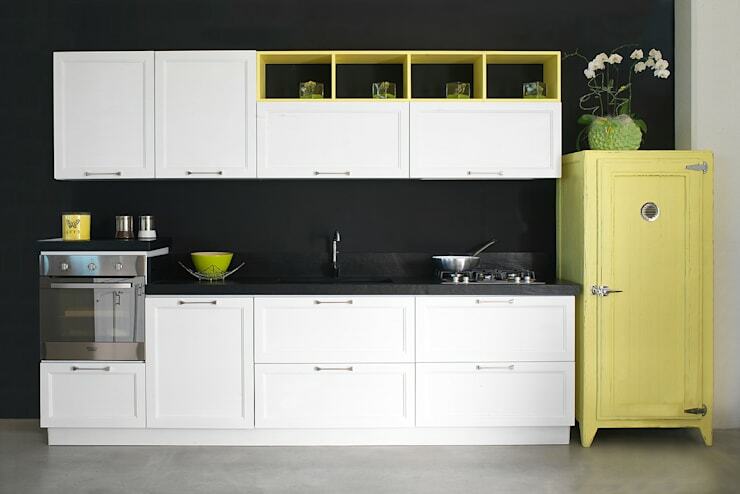 As your cabinets tend to fill up the majority of the space in the kitchen, they are the prime elements that stand out when it comes to colour – attention, therefore, must be paid when considering what tone to go for. But a kitchen is so much more than just a series of cabinets. 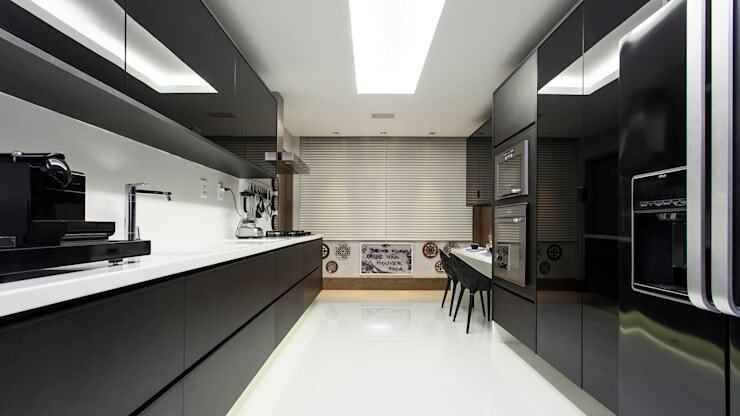 That leads us to the question: dark or light for the kitchen? b)	Having a space that is practical. Let’s first look at all the elements that make up a kitchen, and then take it from there! Your cabinets are one of the major elements that are noticed upon entering a kitchen; therefore, opting for a lighter colour will add a more expansive feel to the kitchen. The white cabinets are synonymous with cleanliness (a very important element in one’s kitchen, of course), lending to it that timeless, fresh characteristic that will never go out of style. Trends come and go, but the white kitchen cabinet is here to stay! Pro: It’s versatile – white goes with anything. Con: Age shows easily. Smudges, scratches and dust are all spotted very quickly on a clear canvas, not to mention spilled food and drink. Some laminates may even discolour to cream or a light yellow with time or because of direct sun. White walls are an ideal backdrop for any colour, and will make the tone of your choice stand out. 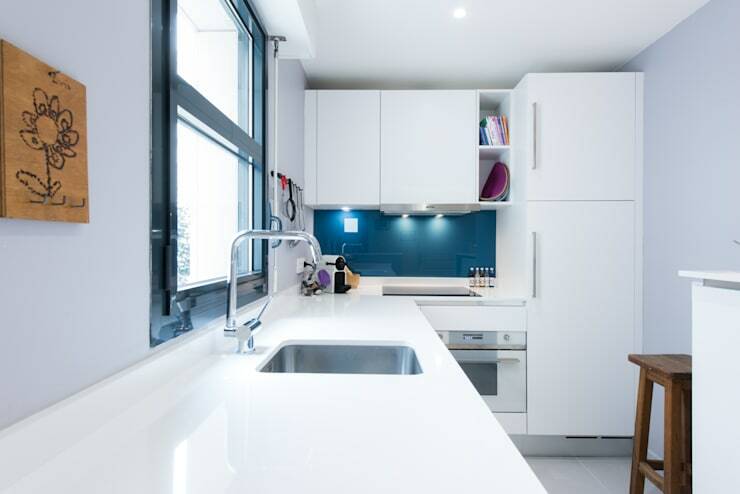 Pro: White is also bright, so it naturally makes a space feel lighter and bigger, regardless of the amount of natural daylight present in your kitchen. Con: It can interrupt the flow. Don’t see your kitchen as a stand-alone room, because it is not – look at it in the context of your entire house. 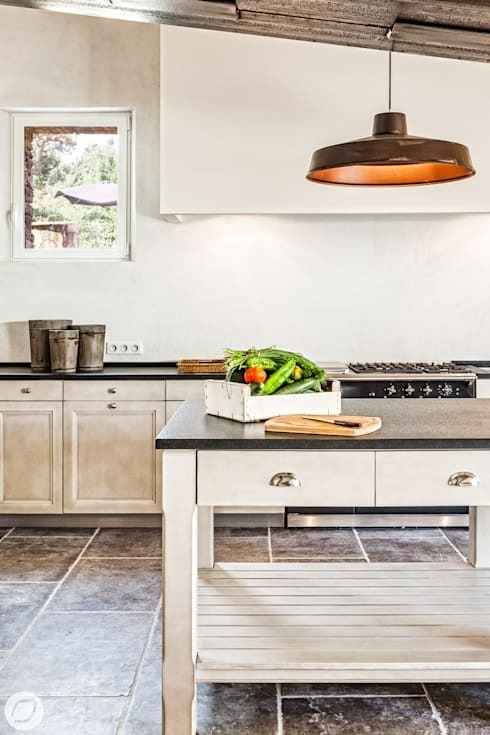 If you want your home’s flow to be natural and optimum, you might not want a bleak kitchen that looks like it’s seeking attention, especially if you have an open floor plan. Tip: to enhance your white wall, add a striking tiled floor, as pictured here. Whether it’s your fridge, toaster or stove, your kitchen just looks “richer” with the added element of appliances. There is definitely a place for white kitchen appliances, especially with dark cabinetry (think charcoal or black), where they can create a sharp contrast and add a striking effect to your kitchen. Pro: As white will always be in style, it is considered a safe choice. It also suits quite a few kitchen styles, such as traditional and contemporary. White appliances are also easy to clean, and are often cheaper than their stainless steel counterparts. Con: A lot of homeowners consider white kitchen appliances outdated and opt for stainless steel instead. Others also feel that white is too safe (boring, if you will). Whether it’s wood, marble or tile, a white floor does have its set of characteristics: elegance, expanse, sophistication. Which is why it has always been a popular choice, whether it’s for your kitchen or bathroom. Pro: Its biggest advantage is its capability to expand a room, especially white tile. Not only does the white reflectivity make any room seem bigger, it also spreads natural light around, so it can help you save on artificial lighting. As they reflect rather than absorb heat, they are also cooler. Con: You need to clean your white floor – often. Not only does dirt show up easily, a white floor will also show imperfections due to wear and tear more readily. Some people also feel that white floors lend a hospital-like vibe (i.e. clinical) to a room. Need some more inspiration for your kitchen floor? A timeless, stunning countertop is a very important element in any kitchen. Should you decide to go white, the next question would be: which white? Do you want undertones of blue, grey, brown, or are you looking for as pure white as possible? Pro: White countertops often project a feeling of luxury. But you’re not stuck with just marble or granite as your choices. 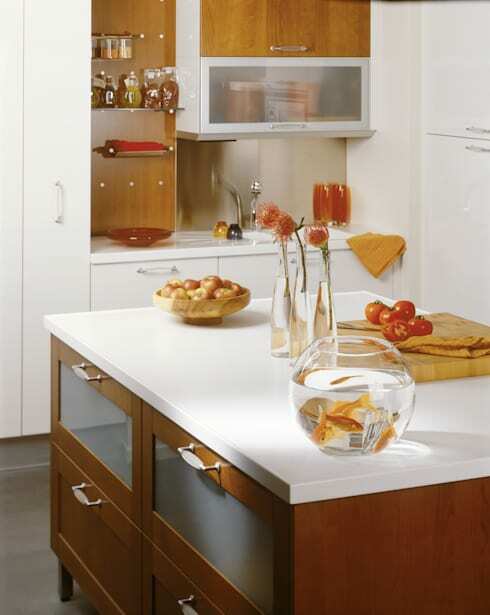 Materials like acrylic composites or engineered quartz surfaces also offer striking and sturdy surfaces in a great selection of white tones. Con: White marble and granite countertops are prone to staining. So should these be your prime selections, be proactive about watching out for spillages, especially when it comes to wine and acids. White marble and granite are also vulnerable to scratches. Some homeowners are of the opinion that scratches add character and charm – however, this is a personal choice. Last, but not least: your kitchen accessories. These include your cooking utensils, pans and pots, mixing bowls, cutting boards, etc. Pro: White accessories against non-white backdrops (for example, black stone countertops with red wallpaper) can add a striking visual touch. And the colourful background will ensure that the white elements are much more noticeable. Con: Your accessories will get touched – a lot. Using your cooking utensils, picking up salt and pepper shakers, passing around serving bowls at dinner parties… these will make them prone to smudges and stains. 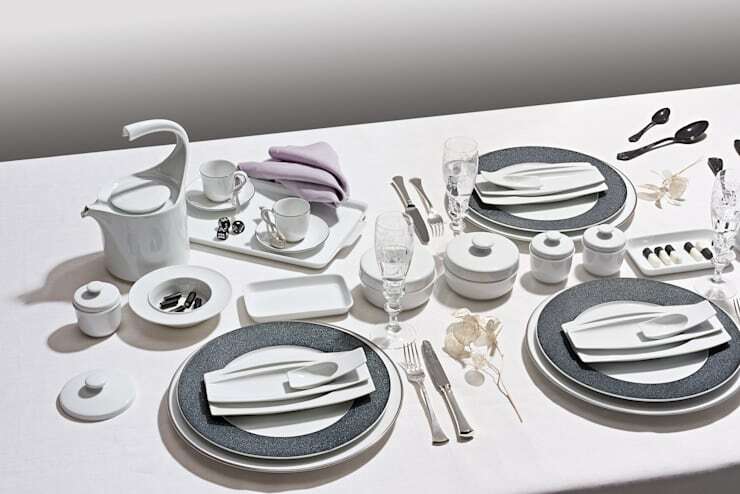 For some stunning white porcelain dinner pieces (or coloured), see what Fürstenberg can offer you! There you have it, lots of information to chew on. Just remember: when mixing white materials, you will never get a set of white that match 100%. So, should you decide to add “an absence of colour” into your kitchen, don’t be upset if the hue of your floor is not identical to, for example, your cabinets. It doesn’t matter! As long as you have a general awareness of undertones, that is what will make your interior interesting.